Among all the storied names of Arctic explorers from the "heroic age," none resonates so widely, and yet (in some parts of the world) is so imperfectly known, as that of Joseph René Bellot. In the search for Sir John Franklin, which attracted support from people of many nations, he became -- in 1851-- the lone active-duty member of of the French navy to volunteer for such service. 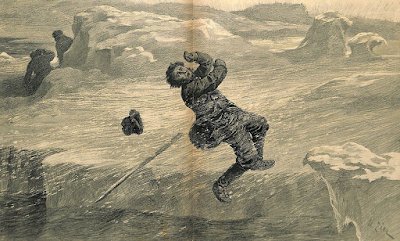 Although only twenty, Bellot was no stranger to exploration and its hardships; having already participated in French expeditions to Madagascar and South America; as part of his embrace of the rigors of Arctic travel, he permitted himself only one blanket, and a thin mattress atop a bare wooden board. He served under William Kennedy during the latter's Franklin search, which covered more than 1,800 kilometers to and from their winter quarters on Batty Bay. Kennedy, for reasons that are still no quite clear, did not seem to fully trust his second; indeed, he went out of his way to prevent Bellot from making independent navigational observations. When the two came upon the strait that bisected Somerset Island from the Boothia Peninsula, Bellot was -- in part as a result of Kennedy's keeping him in the dark -- reluctant to claim it for what it was. 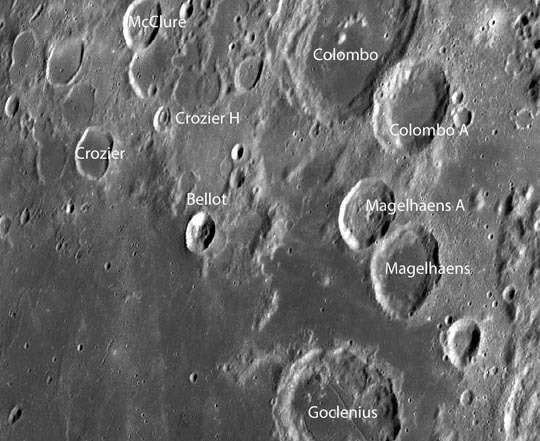 So it was that, when Kennedy named the strait after him, Bellot a first felt more concern than pride; what if this vaunted waterway turned out to be as insubstantial as the Croker Mountains? But it didn't. Indeed, although Leopold McClintock, the first to try to sail through it, was blocked by ice on its western outlet, the Bellot Strait was to become a mainstay of transit between the Eastern and Western Arctic, and is much used to this day; this past August, I passed through its waters three times aboard two different vessels. Because of its strong currents, it needs to be entered at slack tide, and ships often find themselves passing through in company with others. These same current make the strait, effectively a polynya, generally ice-free throughout the year except for that sea-ice that drifts in from one side or the other. Bellot, committed to the cause of finding Franklin, returned almost immediately after his first expedition, serving under Captain Edward Augustus Inglefield. His high personal character and complete devotion to his duty once again drew admiration from all with whom he sailed; no work seemed onerous to him, no mission too risky. It was on one of these -- an attempt to walk over the ice to deliver a communication to Sir Edward Belcher, that Bellot met his end, falling through the ice so quickly that his comrades could find no trace of him save his walking-stick. The area, in Wellington Strait, is notorious for thin ice; one of my shipboard lecturimg colleagues this summer, Christian Haas, noted that it was near this same area in 2015 that two Canadian ice researchers met with a similar fate. It's comforting to think that it could have been just such a patch of treacherously thin ice, rather than some unexpected crack or lead, that took the life of such a skilled and resourceful man. Beyond the strait itself, Bellot's name is remembered in many places in the Arctic and beyond. At Beechey Island, a memorial headboard once stood beside those of Franklin's men; when the others were replaced by replicas, none was made for his, on the theory that it might confuse people as to whether he was buried there. This lack has since been made up by Jean-Claude Forestier, who installed a plaque on a nearby cairn in 2012. There is also, at the other side of the island, a plaque to Bellot placed between Lady Franklin's marble slab and Belcher's Cenotaph. In Greenwich, on the grounds of the old Royal Naval Hospital, a granite obelisk to his memory stands facing the Thames. 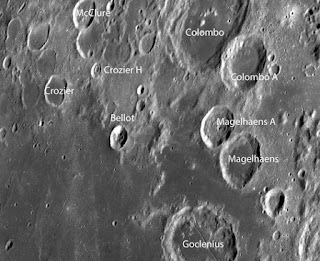 And, perhaps most fiitingly of all, a crater upon Earth's Moon was named after Bellot in 1935; there, in the "Sea of Feritility," it has among its neighbors craters named after his fellow Arctic explorers Crozier and McClure, as well as two named after Ferdinand Magellan. The site of the winter encampment of the first major Royal Navy search for Sir John Franklin's expedition, Port Leopold possesses a sense of desolation unlike any other place I've visited in the Arctic. The vast plateau of barren gravel dwarfs even that of Beechey Island, its lone and level plane stretching out toward distant grey cliffs, with only a few signs that living things ever tarried here. The famous rock, carved by the men of HM Ships "Enterprise" and "Investigator" in the latter part of their sojourn there, still stands; nearby, a small and battered HBC outpost is its only company. 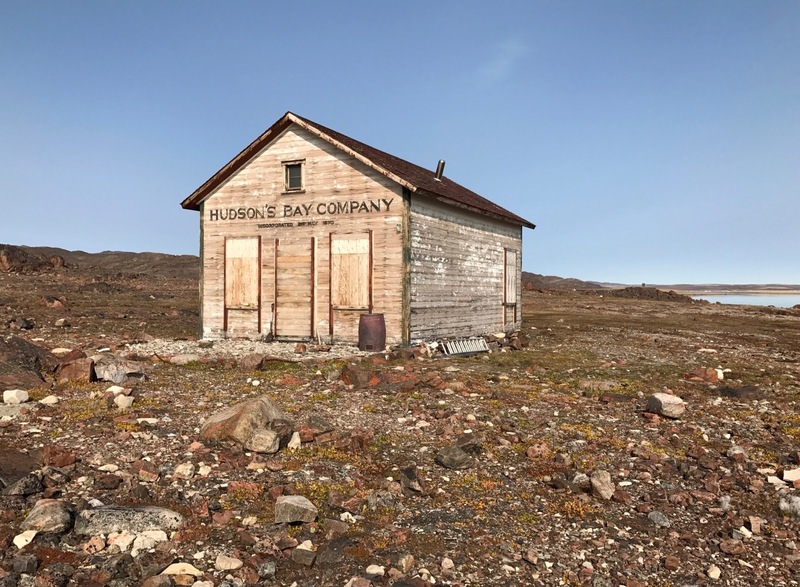 Built in 1926, it was abandoned in 1927, when (as the HBC record drily notes) it was found to be "too isolated" to carry on a profitable trade. The Inuktitut name for the post, Siqiniq -- the sun -- also seems to mirror that isolation (the HBC post at Arctic Bay was symmetrically known as Taqqiq -- the moon). Indeed, the most lively time ever experienced there was likely that of Ross's encampment with his two ships. Sledge parties were sent forth, exploring the northern and western edges of Somerset Island (not yet known to be an island), and on board the ships, the usual regime of stage-plays, schooling for sailors, and other ship-board occupations continued. 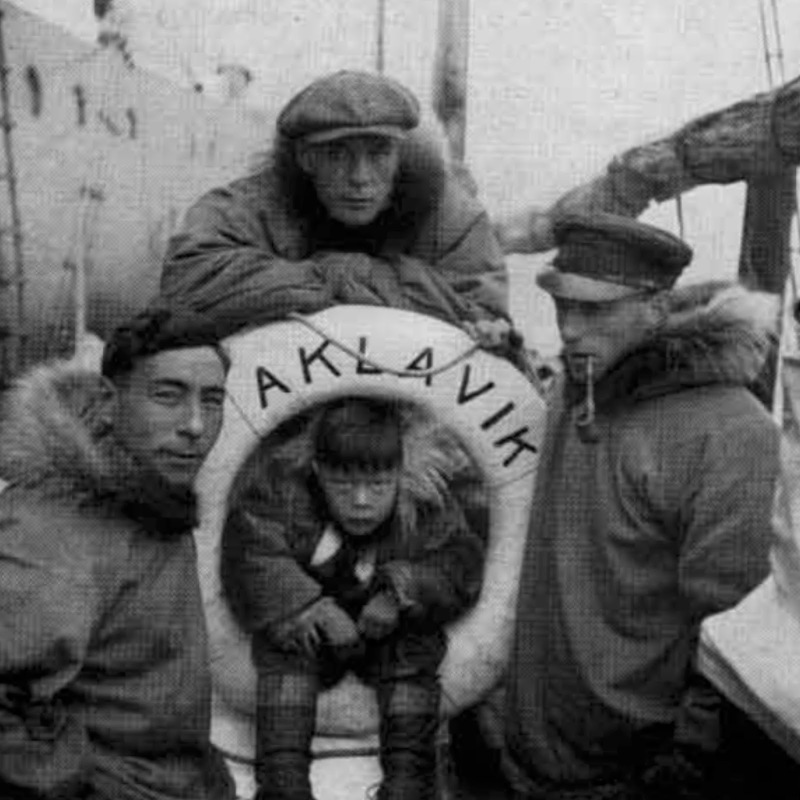 Yet even though the crews spent only one winter, their rate of sickness was unusually high, a problem possibly due to the hastily-assembled provisions and equipment. It had been a cold year coming in, and it was a cold year coming out; the Enterprise and Investigator were not released from the ice until the 29th of August. The date on the rock was one that the men had ample time to carve, motivated in part by the hope that no further date would need to be added. It's not often remarked on, but Ross left behind a store-house full of supplies, should Franklin or his men come that way, said to contain a year's provisions and fuel sufficient for sixty-four persons. Those supplies were never called upon, not does much trace of them remain today, though a slight scattering of barrel-staves and hoops hints that something was there. Arriving at the margin of a lake, which was only one of a series, and tasted decidedly brackish, though its connection with the sea was not apparent, we found the site of a circular tent, unquestionably that of a shooting-party from the "Erebus" or "Terror." The stones used for keeping down the canvas lay around; three or four large ones, well blackened by smoke, had been the fire-place; a porter-bottle or two, several meat-tins, pieces of paper, birds' feathers, and scraps of the fur of Arctic hares, were strewed about. Eagerly did we run from one object to the other, in the hope of finding some stray note or record, to say whether all had been well with them, and whither they had gone. No, not a line was to be found. Osborn was puzzled by the sledge-tracks, which cut as much as three or four inches into the muddy gravel, testimony to their having borne heavy loads. At some points, they veered onto higher ground, "the sledge-parties appeared at last to have preferred taking to the slope of the hills, as being easier travelling than the stony plain." Why Franklin's men would have chosen such means of conveyance, in the apparent absence of ice or snow (or with so thin a cover of these that the runners cut down to the gravel below) is perhaps the first mystery of the place. But there are others. Visiting the site this past August, a mere 167 years later, I found that several of the tins mentioned by Osborn are still visible; near them I also observed many barrel staves and heavy iron barrel-hoops, doubtless from later in the Franklin search era. Most puzzling of all, though, were a series of fragments, some of them quite large, of a boat built using old square copper nails. One long section (seen above) had wooden rubbing-strips affixed, while others showed traces of faded yellow paint. These materials had plainly been there a long time, as the moss had encroached on their borders, but they certainly had not been present in 1850. It's my surmise, though, that these may be parts of Sir John Ross's yacht the "Mary," left at Beechey Island in 1851, and which has been by slow degrees scavenged to such an extent that nothing now remains but her mast and a few broken planks. Why someone would have dragged them to this spot remained unclear, although some graffiti on a nearby plank with the date "1970" suggested that, at least at times, passing parties camped here. Another question is what happened to the two cairns observed there by Osborn's party. The "brackish lake" -- now named Red Loon Lake -- remains, but I could find no trace of cairns nearby. The archaeologist James Savelle, who worked here in the early 1980's, had reported a cairn built practically in the middle of one of the several Thule-era stone hut ruins at the site, but I could find no sign of it either, though in one of the houses I could see a board or plank that looked to be of the Franklin era. Neither cairn, in any case, had ever been reported to have contained a message, leaving the exact purpose of the encampment there uncertain. The cliffs of Caswall's Tower have seen many expeditions come and go; for a time Ian Stirling had a hut up there from which he made observations to determine at what distance a polar bear could smell a seal's corpse. Ours was just the latest of many visits, but I feel certain that there is more to be learned from the site; next time I'm there, I hope to be able to make a more positive identification of the boat fragments. All the same, I'm sure that won't be the last of the mysteries of Radstock Bay. Among the more storied spots that I was able to visit during my voyages this past August is surely Fort Ross, whose significance stretches from the Franklin search era to the 1930's and beyond. Not far from here, Francis Leopold McClintock established a camp at a place he dubbed "Depot Bay": it was from here that he crossed over to take on the search on King William Island. 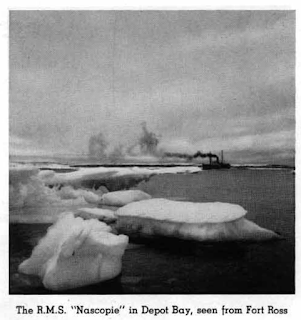 The entrance to the Bellot Strait is just around the corner, and he'd hoped to sail on through it -- but alas, even though its strong currents generally keep the Strait ice-free, that year ice on the western side blocked further progress. Still, it was from here that he departed, and here that he returned, just prior to sailing back to England with the news of Franklin's men and the final note found in the cairn at Victory Point. The spot remained desolate until 1937. That year, the Hudson's Bay Company, in what was to be its last effort at expansion into the High Arctic, decided to establish a trading post at the site. L. A. Learmonth, the legendary trader (and Franklin searcher) was selected to command the post; he was to take ship aboard the Nascopie from the eastern side, and meet the schooner Aklavik which would arrive from the west, to make a meeting of trade from either end of the Northwest Passage. Unfortunately, Learmonth was an impatient man; eager to select the post's site before others had arrived, he and his second left Gjoa Haven early on a motor launch towing a canoe. They ran into engine trouble and ice which obliged them to abandon the launch and make a lengthy portage with the canoe, with the result that they arrived late, with the site for the future fort already selected. It's hard, though, to imagine that Learmonth could have found a better spot -- the fort sits on a low, flat peninsula of land, tucked away in a modest bay from the last point of land on Somerset Island before the eastern entrance to the Strait. The HBC hoped that the fort could capitalize on new sources of Arctic Fox pelts, but that was not to be -- after a slow decline throughout the 1930's, the price of pelts collapsed with the onset of World War II. What was worse, the site turned out to be extremely difficult to resupply; after failing to reach the fort in 1942, the Nascopie came painfully close in 1943 -- the residents of the fort (which included an Inuit community of 16 people) could see the smoke from her smokestack -- but despite the best efforts of her veteran captain Thomas Smellie, she was forced to retreat without reaching them. The staff at the post, then headed by Bill Heslop, would need to be evacuated, but the R.C.A.F. had no plane available which could manage it. The U.S. Army Air Force volunteered to provide a Douglas C-47 Skytrain (the military's version of the DC-3), and J.F. Stanwell-Fletcher, a former RCMP officer turned U.S. airman, parachuted in with supplies -- the first such jump ever made in Arctic Canada. Captain Fletcher's real mission was to find and stake out an appropriate airfield, which -- with Inuit guidance -- he managed to do on a lake about ten miles from the post. On November 9th, the plane managed a landing, and Bill and Barbara Heslop were taken aboard while provisions and ammunition for the Inuit were hurled overboard. At the last minute, it was decided that the Heslops' dog, "Hobo," added too much weight to the plane, and he was left behind. The post would eventually be re-manned in 1944, but by 1948 the HBC had decided to close it permanently, bringing to an end their experiment with fur trading in the area. The post warehouse remains -- stocked for those needing emergency supplies -- along with the trader's house, last used by the Canadian Wildlife Service in the 1970's. It's open to the winds today, its former "comfy chair" a mass of rusty springs, its mahogany trim dry and peeling. The workshop which once had stood nearby was taken down and rebuilt at Spence Bay, which was the eventual home for the Inuit there as well. Except, that is, for four of their community killed in an avalanche; their graves still stand on a rise above the fort, offering mute testimony to the end of a time long gone. The first time I visited Beechey Island was in April of 2004, as part of the filming of the 2005 NOVA episode "Arctic Passage," I didn't have much time to walk around. The film crew had chartered a helicopter, and as soon as they'd gotten the shots they needed, it was time to head back to Resolute. At the time, I wasn't sure I'd ever be able to return -- but now, this past August, I was there three times in the space of two weeks! It never gets old. What's more, being able to see the island from many different directions and angles, and in all sorts of weather, revealed much more about its variability, its place in light and shadow, its moods if you will. On my first visit, in early August, the entirety of Erebus and Terror Bay was packed with wind-driven ice, which obliged us to arrive on the Union Bay side, separated by the narrow tombolo that yokes it to Devon Island. This, as it happens, was the way it was first visited by those searching for Franklin in 1850; having seen an enormous cairn on the cliff-top, Sherard Osborn trekked up its sloping backside, failing to notice the traces of a camp that lay just around the corner. This latter discovery was made by William Penny's men, who came running back to their ship shouting "Graves, sir! Graves!" Where Parry conquer'd death, and Franklin died. On my second visit, scarcely three days later, the wind had shifted, leaving Erebus and Terror Bay entirely free of ice. This time, though, I headed first to the Northumberland House side, which I'd missed on my previous visits. There, remarkably, a few timbers of the old frame still stood, over a dense scatter of barrel-hoops, staves, and rusted cans. 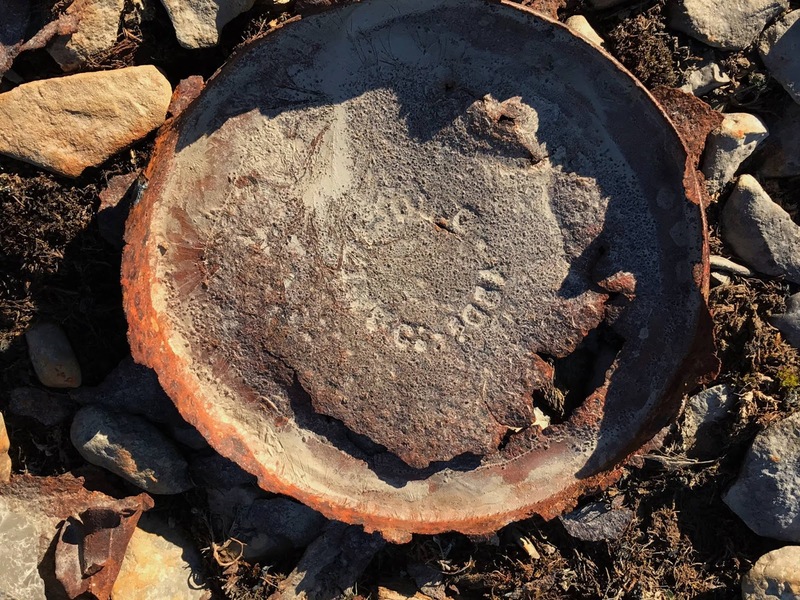 One, on examination, proved to bear the stamped markings of "D. Hogarth & Co." of Arberdeen, revealing this to be one of the tins supplied to Belcher's squadron in 1852 (Thanks to Peter Carney and Gina Koellner for the ID). There, also, the mast of Sir John Ross's "Mary" stood mute testimony to his fidelity in seeking after his missing friend, as did the Cenotaph, atop the tilted marble stone dispatched by Lady Franklin in 1855 with one of the expeditions searching for Dr. Kane, but undelivered until McClintock's visit in 1858. And then, at the end of August -- and the end of such summer as these regions enjoy -- I was there once more, stationed for several hours to interpret at the gravesite as the braver passengers arrived by zodiac. The temperature was just slightly below freezing, but a fresh fall of snow now coated the island, and a constant 30 mph wind rendered my exposed position a chilly one. Leaving on one of the last zodiacs, I turned back toward the sight, knowing full well that this was but the first and mildest harbinger of a winter that would see the entire island plunged into months of darkness and extreme cold. These were Beecheys I could not -- yet, at least -- know, but these graves had already witnessed more than 170 of them. One part of nearly every Arctic adventure voyage in Canada is a visit to an Inuit community. Many of the passengers I met this past month had never before visited a northern hamlet, and weren't sure exactly what to expect. When I was working with One Ocean, they always gave a pre-visit briefing, beginning with a simple yet vital observation: Entering an Inuit community is much like entering the front door of someone's home -- someone that you are just about to meet for the first time. Under such circumstances, of course, most of us would be courteous and respectful; we wouldn't poke about our host's refrigerator or pick up family photos from the mantelpiece, certainly not without asking first. And yet, unless they're made aware of the nature of their visit, many who are traveling up north might not think twice about taking kids' photographs unasked, staring at people's homes, or wandering through the local cemetery. Thanks in large part to the briefing, the passengers I accompanied all acted appropriately, and made the most of a rare opportunity. There are a few things nearly every such event involves: a visit to the main buildings (the hamlet's offices, the Co-Op and Northern Store, and perhaps its health center), followed by a stop at the community hall, heritage center, or wherever the cultural performance or sale of local art and crafts is to take place -- it could be, for instance, in the school gym, as it was when we visited Grise Fiord this past August. For the expedition company, there are forms and procedures to follow; typically these will be worked out with the hamlet's Economic Development (ED) officer, and will include the hiring of local guides, payment for performers, and also for any refreshments. As with many cultural encounters, the breaking of bread (or, more often up north, bannock) remains an important symbolic element of creating a sense of social connection. Sometimes, as with our visit to Grise Fiord, traditional Inuit "country" food is included, such as muktuk, which is always a special treat. And fresh muktuk was available, as it happened because local hunters had harvested several narwhal, which they were still in the process of butchering on the beach. For some passengers, of course, this might be a bit disturbing; a decision was reached to land the zodiacs a little further up the beach, so that it wasn't the first thing the new visitors encountered. Most, when they came to understand the vital importance of traditional foods in Inuit culture, understand and respect their role. Indeed, the relatively low incidence of diabetes (among other health problems) in Grise Fiord is directly linked to that community's greater reliance on traditional, healthier food sources. For this visit, we were very fortunate that our time there was guided by Larry Audlaluk, who is not only the town's ED officer but a leading historian, both of his own people and of polar exploration generally. One of the original group of High Arctic Exiles in 1953, Larry took our group up to the monument erected in 2010, which overlooks the town, and faces the direction of its companion sculpture in Resolute Bay. He recounted the many years of privation and desperation experienced by his family and community after the relocation, as well as the long and difficult journey toward making this place their home, and finally letting go of deeply-felt resentment. He pointed out his house in the town from our location, proudly noting that it's "the one with the Canadian flag." Aftward, we visited the site of the town's water supply, and attended a cultural presentation at the school gym. Although it was only a brief visit, I believe that everyone there gained a new understanding of life up north in a small settlement such as this, and a new appreciation for the history of the community. We all, of course, like to feel sympathy for those who have endured hardship and injustice -- and we all are curious to learn more about each other. With a visit such as this, these two human impulses can begin to grow together -- after all, it's hard to care meaningfully about people you haven't gotten to know.